April 24th, 2015 – Years ago, on cold, raw days like this, my Dad would say, “C’mon, let’s go cut a jag of wood.” The weather was never of any consequence to him, and off we’d go, always coming home to a warm house and a treat to enjoy before heading to the barn to milk. 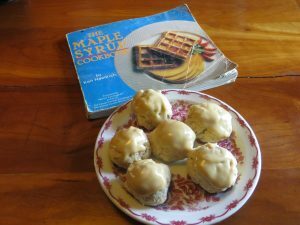 I made these cookies from Mom’s Maple Syrup Cookbook today, embellishing each one with some maple cream. Combine flour, coconut, and baking powder. Whisk together maple syrup, water and oil. Stir mixtures together. Roll into balls and bake 12 minutes in a 350 degree oven on a greased cookie sheet. I cooled them before frosting with pure Vermont maple cream.